Then came the request from my mother in law and I cut her top out mindful that I needed to save enough for my dress. I did, and there's still a bit left over. Love a bit of cut-and-come-again fabric! 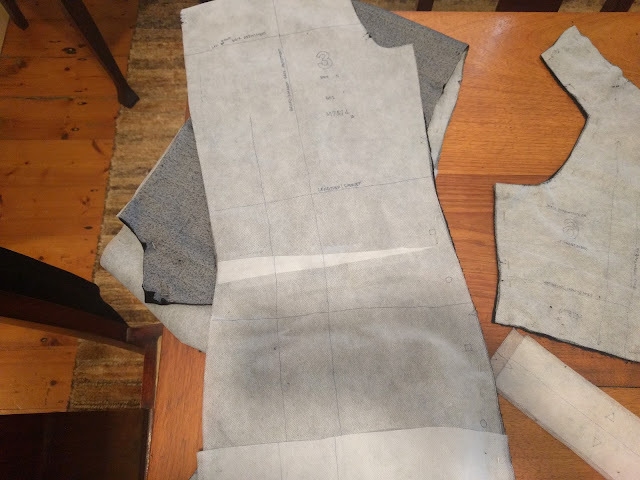 I toyed with the idea of sizing down but couldn't be bothered with tracing the pattern all over again. So I figured instead, if I leave the pockets off I can just run the side seams in until I'm happy. I shortened the dress below the waist by 3" and then got a bit nervous about those side slits. I ended up sewing them further closed than the pattern indicates as I thought they might be scandalously high. I kind of wish I'd left them the full slit as they're not that high after all. I took the side seams in by about 3/4" between the bust and the hips. Not that you'd be able to tell. It's still a comfortably loose T-shirt dress. If you want a tight dress with this pattern you'll need to size down for sure. It was a windy day and my 9 year old was operating the camera so the photos may not show it, but the back and the resultant hem line is definitely an improvement. I think this fabric may have made the shoulder wrinkles even harder to resolve than the stable ponti of my first version. I tried edgestitching them after tinkering with the curve, but then I just shrugged (that didn't help the shoulder situation btw) and got over it. 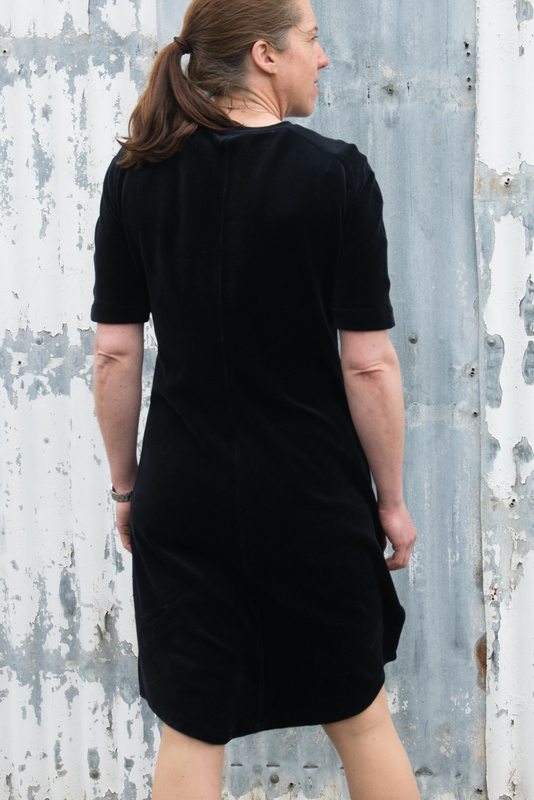 In conversation with some sewing friends on the weekend I was asked about "dealing with velour". I confess I made no special concessions for this fabric. I used a lot of pins so the fabric didn't have much of an option to "walk" as the seams were sewn. Swapping the regular presser foot for a walking foot would be a wise move. You should probably do that when you sew velour. Me, I just shrugged and poured a glass of red. That's a beautiful dress! I wouldn't have that pattern cover a second chance based on just the cover, but your dress made me go look for it. Sounds like shrugging and a glass of red solve a lot of issues hehehe But seriously, the dress looks gorgeous. It might be a t-shirt dress, but it doesn't look like a boring t-shirt dress. I made this in bright red velour for Miss 17. She also ended up with a shoulder line that would be big on Olympic rowers. I trimmed and reshaped from upper arm to the neckband, marginally happier Miss 17. She hated the square raglan (sigh). And it's bike friendly.... winning at velour! It is stunning, very elegant. 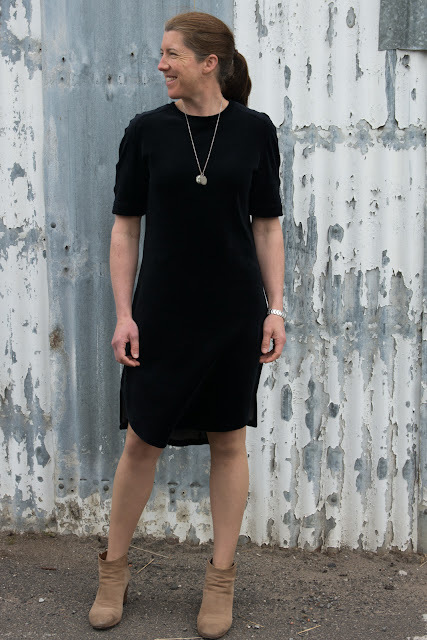 You just can't beat a nice simple elegant black dress!